Can moons have moons? Yes! Well, sometimes. I get asked lots of questions by people curious about the Universe. Some of them are more common than others. Are black holes real? (yes) Do I believe in aliens and flying saucers? (yes, and no). Another one, one I’ve wondered about myself, is: Can moons have moons? The issue has come up recently for two reasons: One is the recent possible discovery of a moon orbiting an exoplanet. The other is that a pair of astronomers, Juna Kollmeier and Sean Raymond, put out a paper doing some pretty interesting calculations about all this to see if a moon really can have a moon of its own. In that thread I briefly go over some of the concepts, but there’s a lot more going on here. So let’s take a look. Can a moon have a moon? It turns out there’s an easy answer to this, and a more complicated (but still cool) one. The easy one is: yes! And you already knew this, if you thought about it the right way. After all, several Apollo missions orbited the Moon, and we have other probes that have done so as well, like the wonderful Lunar Reconnaissance Orbiter (I mean, c’mon, it’s right there in the name). But that’s not really what you mean, is it? You want to know if a natural moon can orbit another moon. The answer to that is different. It’s: yes! But only sometimes. And we’ve never seen one. At least not yet. First, what’s a moon? Simply put, it’s an object that orbits a planet (what’s a planet? Well, that’s harder to define, and also IMO not terribly important). So a planet orbits a star (usually) and a moon orbits a planet. So what orbits a moon? There’s been some discussion about what to call such a thing, and while some folks like “moonmoon,” I don’t care for it. Not because it’s silly — heaven knows we have lots of silly names for classes of things in space — but because it’s hard to say and isn’t as descriptive as it could be. I prefer “submoon.” Easier to say, and the meaning is clear*. So, submoons. It turns out they can exist, but only under certain conditions. And for that, we have to talk about gravity. Look at the Earth and Moon, for example. The Earth is much more massive, by a factor of about 80, than the Moon. That means if you put something in a wide orbit around the Moon, the Earth’s gravity can be enough to yank it away. The farther away a submoon orbits the Moon, the more influence Earth has. Even if the Earth doesn’t simply pluck it out of orbit, the Earth’s gravity might be enough to perturb it, change the orbit subtly, Then every time it passes between the Moon and Earth the orbit changes a little. Those add up, and eventually the submoon is lost, flung out into space, or sent crashing into the Moon or Earth. The size of a moon’s Hill sphere depends on three things: The mass of the planet it orbits, the mass of the moon, and how far the planet is from the moon. This makes sense; a more massive moon can hold on to submoons better, but a more massive planet makes that harder. And if you’re too close to your planet, it strips away the submoon. The math isn’t that hard (you can plug and chug for the most part). For example, using the Earth and Sun, the Earth’s Hill sphere is about 1.5 million kilometers in radius, well past the Moon’s distance of 385,000 km. Interestingly, the Moon’s Hill sphere is about 58,000 km from its center (or roughly 56,000 km from its surface, accounting for its radius). That’s pretty big! So yes, the Moon can have a submoon. To be picky, it turns out that even if you’re inside a moon’s Hill sphere, the planet’s gravity can still poke and prod you, destabilizing you over time. That’s hard to calculate, but a decent estimate is that you’re stable for a long time (like, billions of years) if you’re within half the Hill sphere’s radius. So, for the Moon, less than 28,000 km from the surface. But there’s a problem if you get too close to a moon, too. I mean, obviously, you have to be outside the moon’s surface to orbit, or else kapow. Impact. But there’s also the problem of tides. In a nutshell, tides are an effect of gravity. Because gravity weakens with distance, a big object close to a bigger one feels different amounts of gravity across its width. If that difference gets too much, it can rip the object apart! This distance where that happens is called the Roche Limit. It depends on a lot of things, including the masses of the two objects and the size of the smaller one. You can also calculate it based on the ratio of the two objects’ densities and the size of the larger one. But in the end, it means you can’t get a submoon that’s too big and close relative to its parent moon, or else it’ll break up. And now, finally, we can take a look at what was found by the astronomers who looked into this and did the math. They asked a very specific question: Can you get a submoon orbiting a moon in our solar system and have the orbit be stable for the lifetime of the solar system, 4.6 billion years? It turns out not many moons in the solar system can host a decent-sized (say, 10 km) submoon. For some, the Hill sphere is inside the moon (for example, with a very low-mass moon orbiting close to a massive planet), or so small that you can’t get a stable orbit. But they did find several, and the list is interesting: Our Moon (which we knew from what I showed above), Saturn’s moons Titan and Iapetus, and Jupiter’s moon Callisto. Titan is massive, and so it can hold its own against Saturn, while Iapetus and Callisto are far enough out from their planets that their Hill spheres are reasonably big. Our Moon is a mix of both reasons. As soon as I read that part of their paper, the hair on the back of my neck stood up. Iapetus has a tremendous ridge of mountains stretching literally all the way around the moon on its equator. It’s not known how it formed, but it might have been from a slow-speed collision with a smaller object that got torn apart; the debris then encircled the moon and collapsed along the equator. 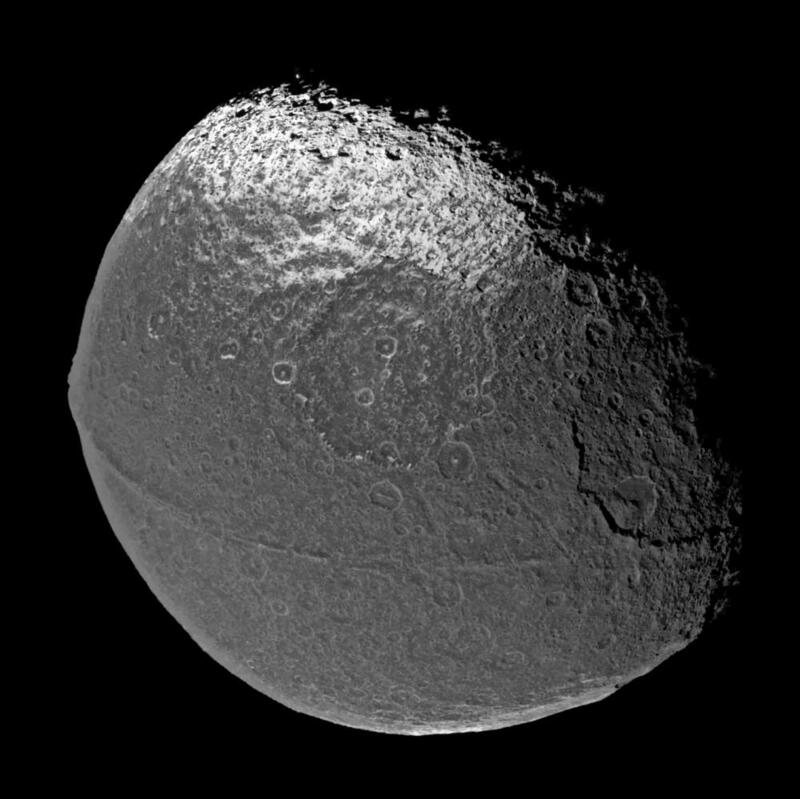 The easiest way for that to happen would be if Iapetus had a small moon itself, and eventually Saturn’s influence (and/or that of other moons orbiting the planet) caused it to get too close to Iapetus. Then Roche took over. Hmmmmm. It’s not proof at all, but it’s sure interesting. So it’s certainly possible for a moon to have a submoon. Cool! But if that’s the case, why don’t we see any? Well, for one thing some might be too small to see well. Something, say, ten meters across would be pretty difficult to spot orbiting our own Moon, let alone Titan. But we certainly don’t see bigger ones which should be visible, and that’s interesting. The problem may be that forming along with the moon and planet in the first place isn’t possible; the disk of gas and dust swirling around a baby star may be too chaotic for a submoon to condense easily. It’s possible to capture an asteroid and have it become a submoon, but that’s very difficult and a rare occurrence. In other words, while there’s a region around a moon where a submoon is stable, it may just be too hard to get a submoon in the region in the first place. But there’s more. Over time, the tides from a planet affect a moon’s orbit. The details are complex, but for example, our Moon probably formed extremely close to Earth, and over billions of years has receded to its current distance. It’s still receding by about 4 centimeters per year. When it was really close to Earth, the Moon’s Hill sphere would’ve been very small, even inside the Moon. If that’s the case, a submoon couldn’t have formed! By the time it got far enough away from Earth to have a substantial Hill sphere it was too late. In the case of Saturn and Jupiter, the other moons orbiting those planets are pretty dang big (Titan and Ganymede are both about the size of Mercury!). They can affect submoons as well, destabilizing them. That may be why we see no submoons in our solar system. But that doesn’t mean they don’t exist! In the research paper Kollmeier and Raymond show that the possible exomoon Kepler-1625b-I could have an exosubmoon, including one of a decent size (and Raymond talks about this in a blog post as well). It’s not hard to imagine situations in other star systems where this could happen, too. How poetic! An alien star, circled by an alien planet, circled by an alien moon, circled itself by a far smaller but perhaps substantive alien submoon. It’s too bad we don’t have something like that here, but it’s a big Universe. And a fun one to think about. My thanks to both Sean Raymond and Juna Kollmeier for their enthusiastic help with a couple of questions I had about submoon stability. *Note that in that Twitter thread earlier I myself am guilty of using “moonmoon” (though I actually use “exomoonmoon”). But that was for Twitter, where I sometimes let myself be sillier, as opposed to here on the blog where it’s nothing but dignity. † I’ve written about it before, specifically in reference to some people’s claim that technically, the Moon doesn’t orbit the Earth (it does), and also in reference to Pluto being a planet or not.